We are pleased to announce our new, comprehensive online training option on Chambers Pivot Industries’ approach to applying strengths in business development. Since you have expressed an interest in the principles of FIT for business growth, we are happy to make this available to you. Greg Chambers has been helping clients put individual sales strengths to use in business development for years. 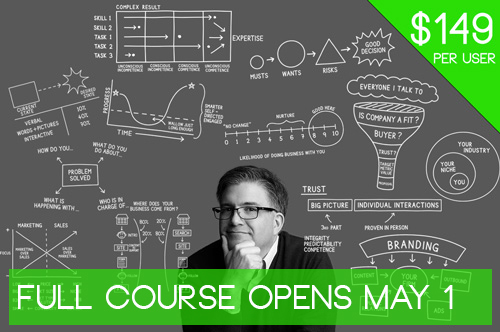 The course is designed for anyone rewarded for uncovering new business opportunities. Greg will help you find more business, faster than you ever thought possible. He’s worked with everyone from CEO’s to administrative assistants in putting these principles to work. Speeding up the sale without being unnatural or pushy. Turning negative or not interested responses into future revenue without stalking prospects. Staying committed to your individual process, even when results are slow to arrive. This online course is based on FIT concepts and is designed to provide ideas, exercises, and direct feedback from Greg Chambers, plus the ability to see how others are applying the lessons. This self-paced course and all of the required materials is only $149 per user and include a 30 minute consultation with Greg Chambers and unlimited email access during the course. This course is based on material in "The Human Being's Guide to Business Growth: A Simple Process for Unleashing the Power of Your People for Growth." A physical copy will be sent to you and an ebook will emailed immediately.